Environment Agency contractors have started work on the banks of the River Wharfe in Collingham, near Wetherby, to repair damage to the river bank and protect flood defences. 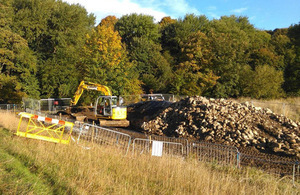 Work is underway to repair approximately 40 metres of river bank in Collingham adjacent to the flood defences at The Avenue, so that it is ready for the winter season. Contractors are expected to be on site until Friday 28 October. The bank needs repairing because further loss of material could damage or weaken the defences at Collingham. We are installing rock armour along the base of the bank, where the material was washed away during the Boxing Day floods. We’ll then reinstate the bank behind it. We apologise for any disruption or noise this may cause residents on the Kingfisher estate and the Avenue, and thank them for their understanding and cooperation while we complete this crucial work. This work is one of many projects we’ve been doing along the Wharfe to repair damage done by floods and get our defences back to standard for the winter season. These repair works are part of the Environment Agency’s asset repair programme, put in place to repair the region’s flood defences which were damaged by the Christmas floods. Officers have checked 8,500 assets and cleared obstructions such as collapsed bridges, buildings, thousands of tonnes of gravel, debris and vehicles from rivers to reduce further flood risk at 150 locations. Since the Christmas floods, the Environment Agency has also carried out bank repairs on Millbeck Green in Collingham. The flood warning area has also been reviewed and adjustments have been made. We have since installed an alarm that allows us to issue a flood warning from telemetry in the Wharfe at The Avenue, Collingham. A flood warning was not issued to properties in Collingham on Boxing Day as the alarms further up the catchment were not triggered, and there was no alarm on the telemetry at Collingham to alert officers to the situation. Other watercourses feeding into the river further downstream may have caused the heightened river flows through Collingham. Improving the telemetry network will enable the flood warning system to better inform communities when overtopping of rivers is expected. This includes Tadcaster as well as Collingham and Ulleskelf. The Environment Agency will soon be sharing a plan explaining what other activities we are undertaking within the Wharfe catchment to reduce flooding. Residents and businesses can check to see if you are eligible for the Environment Agency’s free flood warning service and sign up by calling Floodline on 0345 988 1188 or by visiting the website. As well as checking flood risk, residents can also find out what action they can take to protect their personal safety and property by visiting the Environment Agency website at www.gov.uk/floodsdestroy. The website also includes advice on how to prepare for flooding, and develop a flood plan.